Grammar is without a doubt one of the most daunting aspects of the English language, an area riddled with complexities, inconsistencies, and contradictions. It has also been in a state of flux for pretty much its entire existence. For native speakers of English, as well as for those learning it as a new language, grammar presents a very serious challenge to speaking and writing both accurately and effectively. Having a single, reliable, go-to reference guide should, therefore, be indispensable to those trying to learn, improve, or perfect their speech or writing. 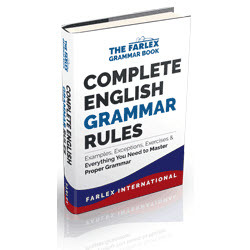 The farlex grammar book is what you need to enhance your vocabulary as well as writing English language effectively. This book is the most comprehensive guide to English grammar in everyday speech and writing. This product provides a clear, unambiguous, and comprehensive source of information that covers all the relevant topics of English grammar, while still being easy to understand and enjoyable to read. Every topic in the book has been broken down into basic units. Each unit can be read and understood in its own right, but throughout the book, you will find cross-references to other sections and chapters to help make it clear how all the pieces fit together. If you're having trouble understanding something, try going back (or forward) to other related topics in the book. Because English is such a flexible, inconsistent language, the "rules" that are often bandied about are usually not rules at all, but rather guides that reflect how the language is used. Accordingly, the guidelines contained within this book are just that--guidelines. They are not intended to provide constructive or prescriptive rules that confine everyone to a particular way of speaking or writing. Learning how the English language works will enhance your engagement with speech and writing every day, from the books you read to the e-mails you write, to the conversations you have with friends and strangers alike. Farlex International is the team behind TheFreeDictionary.com, the online reference destination with 1 billion annual visits. TheFreeDictionary.com is a compilation of dictionaries and encyclopedias from the world's most trusted publishers, including McGraw-Hill, Houghton Mifflin, and HarperCollins. Since its founding in 2003, TheFreeDictionary.com has grown to include a vast and diverse amount of reference content, including multiple thesaurus sources and specialty dictionaries covering fields such as grammar, science, medicine, law, finance, idioms and slang, acronyms, computing, and more, as well as dictionaries in 14 other languages. Farlex dictionary apps powered by The Free Dictionary have been downloaded by tens of millions of users across multiple platforms, with top ratings after hundreds of thousands of user reviews. This book is divided into 3 volumes for you to be able to understand and write English language accurately. Quickly master Basic English grammar while learning more advanced topics along the way. Easily identify nouns, pronouns, verbs, adjectives, adverbs, prepositions, and other parts of speech. Master verb tenses and conjugation, including irregular verbs and exceptions. Learn about every type of sentence and avoid common writing mistakes. Get the only punctuation guide with simple, easy-to-remember rules for all punctuation marks: periods; commas; semicolons; colons; question marks; exclamation points; apostrophes; quotation marks; hyphens; dashes; parentheses; and more (even lesser-known symbols). And everything you need to punctuate confidently! Forget about memorizing the hundreds of thousands of words in the English language. Get the only spelling and pronunciation guide that gives you all the tools you need to tackle even the hardest words to spell and say. Correct and incorrect examples displayed side-by-side. Simple tips and tricks to avoid the most commonly misspelled words and pronunciation mistakes.